Birdwatcher Extraordinaire, Ecologist at Monash University and Writer for Wild Melbourne. Dr Rowan Mott scarcely escaped a herd of stampeding elephants in Africa. He has sat inches from hyenas sniffing his feet under an exposed door and has sighted over 600 species of birds in Australia, making him one of the top ranked bird watchers in the field nationally. Rowan grew up amongst the paddocks that shone emerald green in the depths of heavy winter rain and parched yellow resembling straw in the high heat of summer. Days were spent exploring the countryside; down by the dam and up over the rolling hills that once seemed so far away. Beside the arching gumtrees Rowan walked, past the vege-patch and along the creek bed, spotting songbirds overhead. Some days, the melody of a bird call was the only thing accompanying the silence. The solitude was something Rowan enjoyed. He still does. His Father a gardener and his Mother a librarian, nature and books were his natural companions. Rowan went on to study science at University, first at La Trobe, then Monash. Each morning he diligently rose at 6.30am, making his way out to the Clayton campus from North Melbourne. Two trains. Then a bus. Whether it be sunshine or cold Melbourne rain, his voyage continued. He is a creature of habit. One of the most devoted and determined of his ilk, Rowan researched for long and concentrated hours. Each day. Until 5pm. No earlier would he leave his desk. Often on his weekends he would venture out to the Werribee sewerage farm where some of the most diverse bird species thrive, and peculiarly no, it does not smell. Rowan travelled further afield on Uni trips, sourcing data and collating new findings. He is disciplined. Rowan’s passion for science and nature exceeds ordinary standards. He prides himself on his knowledge. He admires David Attenborough and sharing his curious and ever-changing discoveries of our natural world, contributing as a feature writer for Wild Melbourne. Nature play is such an important part of childhood. Interactions with nature and science impact our everyday lives, and most profoundly, our future years on earth. Rowan examines and observes our natural wonders to share with playgroupers. The natural world is hugely important to us. We rely on it to provide the air we breathe, the water we drink, and to give us a sense of wellbeing. There is a growing amount of research that says being outdoors and around trees has huge positive health benefits. If we are to maintain healthy natural places, then science is going to be the reason why. The ever-growing human population is putting pressure on natural environments, but scientific advances in farming are enabling our farmers to produce more food on smaller farms. This will be key to making sure that we don't need to use all of the land to produce our food, and many natural places will be able to survive. When we are outdoors, what interesting things might we miss? When we are outdoors, the two most common things that we might miss are things that are very small and things that we can't see. Insects are everywhere around us, but except for a few different types, such as mosquitoes and house flies, we rarely notice them in our everyday lives because they are small. Just because we don't notice them does not mean that they are not important. Insects do many great things for the environment, from helping flowers to reproduce by spreading pollen; to being a food source for other animals including birds, bats, ground-dwelling mammals, and reptiles; to breaking down dead plant material and returning the nutrients it contains to the soil. Some people hate insects or are scared by them, but really they should be thankful for them because without them, the lives of living things would be very much different. The other thing that we may miss is things that we cannot see: but we can hear them. Sounds are all around us, but we seem to ignore them in favour of things that we can see. If you are out in your garden, take a moment to listen to the sounds of the birds calling. There will rarely be a minute that you cannot hear one calling somewhere. Each species of bird has its own unique call and if you practice listening to them and figure out what call belongs to each type of bird, you will notice that many more different species are regularly visiting your garden than you may have realised by using your eyes alone. Scientists often use bird calls to figure out what species are at certain place and it is easy for you to do the same. Simply count the number of different types of birds you see or hear in a five minute period. How does science impact our everyday? Science is everywhere in our lives. It always has been even before the word science was invented. Evolution is happening all the time. Mostly it happens too slowly for us to notice it and we have to look at fossils to work out how different species have come to be in their present form, but there are windows into evolution that are more obvious to us. Our pet dogs are a great example. Not that long ago, there were wolves but no domestic dogs. In a very short time we have produced a huge number of different breeds. These different breeds came about because we liked certain things about them, such as the speed of the Greyhound, and the non-shedding, curly hair of the Poodle. By selectively breeding individuals with these features, we have mimicked how evolution shapes different species. We have used the many different forms that evolution has brought into existence in many, diverse ways. Perhaps the most spectacular is the way we have mastered the power of flight. The first flying machines were modelled on the way birds fly and since the first of our flying machines took off, we have been refining them ever since. If evolution hadn't resulted in birds being alive, perhaps we wouldn't be able to go on overseas holidays so easily. What has it been like to work in the scientific field? Has it enriched your existence? What makes you passionate about it? Being a scientist is a great job. It's my job to learn things every day and even more exciting, to discover things that no one even knows about yet. Last year I discovered that a species of seabird I was studying migrated from Western Australia to Indonesia. To think that a bird that I have held in my hands has flown all the way there and back again is truly amazing. Although this journey is amazing, it means that these birds need protection in Australia and Indonesia as well. Challenges such as finding out the best way that we can protect these birds are what makes me passionate about science. If there aren't people working to protect our natural environment, we would all be worse off. Being an ecologist is also great because it has taken me to some remarkable places to do fieldwork. Some highlights include islands in the Torres Strait, and the spectacular Kimberley coastline. What advice would you have for young children dreaming of what they want to be when they grow up? Would you encourage them to explore a scientific field of work? I think it is important to be flexible. What you want to be now may not be what you want to be when you grow up. I wanted to be all sorts of things when I was a kid - a jockey, a fighter pilot, and only later did I decide I wanted to work with birds and become a scientist. So whatever you might want to become, work hard and do your best at everything you do, then you will be strong at a number of things and be in a good position to do whatever you want when you finally get there. Would I recommend that you become a scientist? Absolutely! The best way to do so is to never stop asking questions, and always wonder why all of the things around you are the way they are. 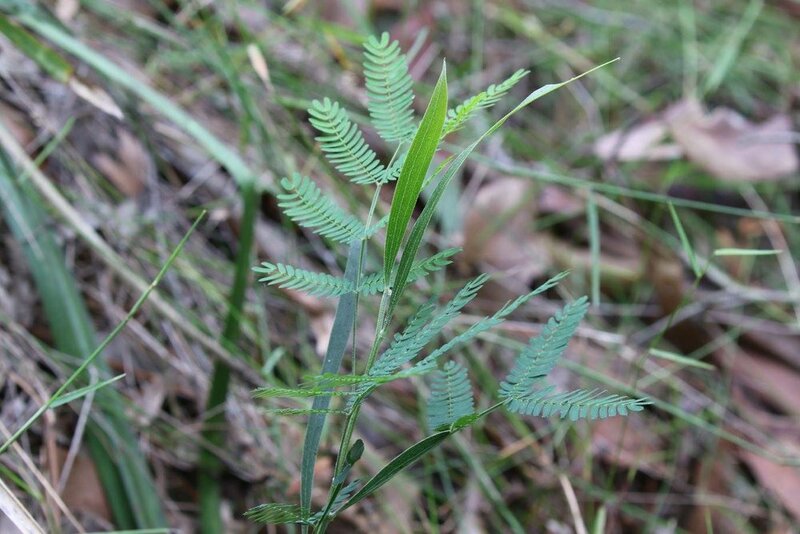 Adult and juvenile leaves of Blackwood — in Trentham, Victoria. Fungi pushing through the leaf litter — in Trentham, Victoria. "Unusually for Australia, I saw more mammal species than bird species this evening."